Nightmares from the Deep: The Siren's Call is rated 4.5 out of 5 by 57. Rated 5 out of 5 by Kirbmeister from An Enjoyable Mix of History, Folklore, Pirates and Mermaids After playing either the complete or demo version of hundreds of HO games, I only write a review on games I find above average, extremely poor or that contain some unique element not normally found in other games. 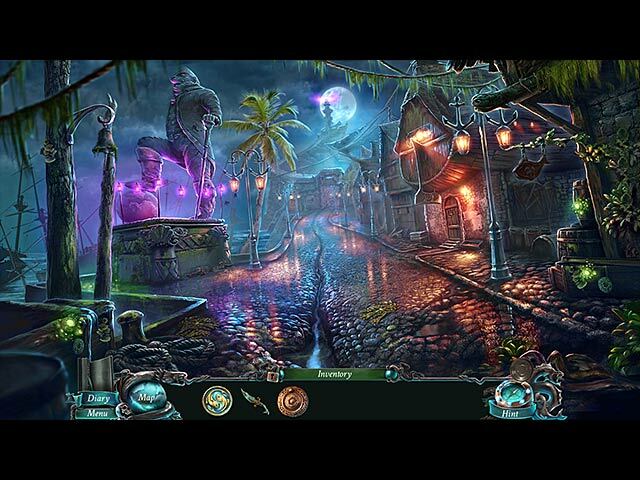 I found that this game does the following extremely well: Continues and Improves on a Successful Series - This is a continuation of the story of the Curator of a Nautical Museum and her daughter involved in the world of Pirate history and folklore. Although some elements, particularly puzzles may be repackaged, in general this game is unique and the best of the rest of the series is improved upon. Read other reviews for more background story. Handles a "Fantasy" Theme - Mixing historical Pirates and modern life creates an imaginary environment which although fictional, is presented in a believable manner and contains real historical elements. Fantasy is not my favorite genre, however, this game makes it real enough to enjoy your trip. Handles Cinematics and the Required Delivery of a Backstory - I normally skip almost all cinematics if I am able to because they are usually boring and long. In most games they are often a screen pan or a zoom in or out of a static image. In this game, they are active, visually striking and rival some enjoyable, (although older) video games. Many of this game's cinematics are interactive requiring the player to contribute to the scene to reach it's completion. You also have the option to Skip them. The requisite background story is delivered through the common use of journals/diaries of various characters, but also an interaction with a shriveled sea creature with sad eyes, guarding a chest. Throughout the game you collect tokens which when delivered to the creature, prompt him to tell a small amount of the backstory. Each of his story additions as well as the journal entries are short and may be skipped. The delivery of the tokens is a necessary part of completing the game, watching the clips is not. Handles Character Dialogue - Listening to the characters may be skipped, but even more appealing is that if you can read faster than they speak, you can click on the screen and advance the dialogue. This allows you to get the information you need without waiting as a character drones slowly on. Requires the Player to Perform More Realistic Actions - Putting a key near a lock does not automatically open the object. You must insert the key, turn the key and push the handle to open a door. Using a tool like a screwdriver requires removing each screw individually. Breaking an object with an ax or a hammer, etc. requires that you strike the object more than one time. With evil villains, heroes and heroines, vibrant scenes, a fantastic tale and a "fishy" love story, this game has something for every HO gamer. It is presented in an immersive manner and moves along without creating boredom. It certainly gained a place on my list of favorite HO games. Rated 5 out of 5 by lainme from awesome game The first game is good, and this one is even better. Similar to the first game, the animations and interactions are very impressive. 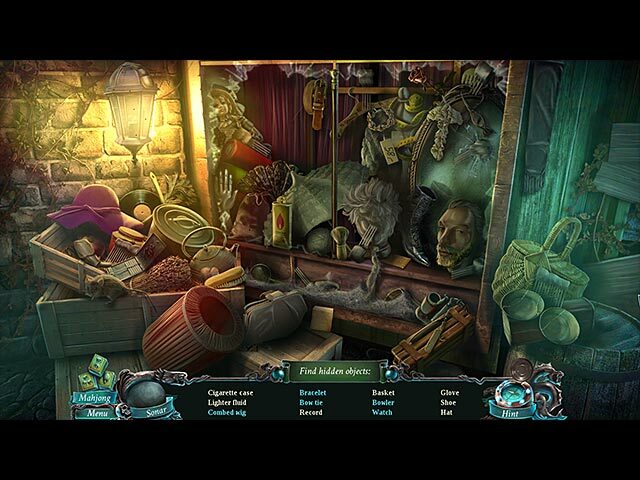 Rated 5 out of 5 by moxy31 from Great Game I really enjoyed this game and loved all the hidden objects and the length of the game was amazing. Well worth the money to me. Rated 5 out of 5 by mouser9169 from All that and a side of calamari! I'm copying this (and editing it a bit) from my review of the CE version. This review is based on a complete playthrough of the game and bonus content. First up, the CE stuff, so you know what you miss getting the SE: I was critical of the first Nightmare's for lack of 'bling' - they brought it in barrels for this title. Three kinds of collectibles, not easy to spot - I only found half of the morphs. Achievements, from basic gameplay to 'Do a mahjong level in a minute'. The usual swag package of art and redoable puzzles and stuff. The bonus chapter took me a bit over an hour. The main game ends conclusively, this adds a bit more information to help set up the next title. Heavy on the HOS and a few puzzles, light on story/plot, but it was interesting and enjoyable to play. Now for the main game: I played on expert, the highest of three difficulty levels (can be changed in game). No sparkles anywhere, no objectives shown on map (they are for the first two). The map is a 'jump' map, and the diary fills up with useful information and tasks, crossing off the titles of the sections you've completed. THE GOOD: The main game took me about six and half hours to play, with me playing mahjong instead of the HOS (misclick penalty starts sending me seasick). I'm a slow player, I like to enjoy the scenes and look for the collectibles and move around the map, but you are definitely getting your money's worth in this game. The HOS are the 'very interactive' variety - get this, use it there, find these, do this with them, eventually you reach the end and get your object. Or you can do the mahjong. Directional Hint, lockable inventory, well written journal and just general UI and game mechanics goodness. The music: Play with your sound on! They didn't call this Siren's Song for nothing. Beautiful, haunting, charming, emotive music.Voice overs were good, too. The story starts off strong and gets you caring about the characters. They also did a great job of keeping a sense of urgency through the game: yes, we know we have all the time in the world to play, but it shouldn't _feel_ that way - and it doesn't. THE BAD: Mahjong could have been more challenging. They went with a very simple tileset (simpler than in the last title) and still auto-shuffle, so no real thought or planning required. I get why they do that (you have to 'play' the game in reverse to build a for certain winnable level, and that can take time, especially on mobile platforms). Still, that was the only 'ding' I could find. That and the misclick penalty - It goes with the nautical theme, but seasickness isn't my thing. THE UGLY: Nothing. Seriously. BOTTOM LINE: Tough call, but I'm listing this as my new favorite over Angelica Weaver: Catch Me When You Can. This is how you do it. If you don't care much about the collectibles and achievements, then the SE is a great buy. The game ends solidly, there's nothing 'required' in the bonus chapter either to complete this game or to understand the next. I don't give five star reviews often. I save them for games like this. Unequivocal recommendation. Rated 5 out of 5 by Chezlee14 from Fun Game--Better Than "Cursed Heart" Based on my completion of the standard edition version of the game: I enjoyed both Nightmares from the Deep games, but I thought this game was better than "Cursed Heart." In fact, a lot of the issues I had with the first game have been revised in "Siren's Call." The storyline is even more engaging and has a fair number of cut scenes with interesting characters, the voice actors of which are much better as well. I personally enjoy these elements as I like games that feel like an interactive movie/story. There is more of a challenge to this game than "Cursed Heart" as well. There are more puzzles without an over-abundance of HOS. For the HOS there are, they are interactive, which I also enjoy. However, the puzzles are still very easy. So easy, in fact, that even a beginner may grow tired of these puzzles that take only moments to complete. The graphics are pretty, basically the quality of a modern cartoon/movie. The animation, especially mouth movements, are odd at times, so if that bugs you, it is something to consider. I gave "Cursed Heart" only four stars, but because this game was much improved, I give it five stars and definitely recommend! 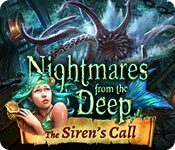 Rated 5 out of 5 by cybersauced from NIGHTMARES FROM THE DEEP: THE SIREN'S CALL ~ SING'S ALL THE WAY THROUGH With there already being a lot of detailed reviews, I'll just get to the point. Siren's Call is a 5-star game. There is a great ending, keeping with the storyline. Puzzles are easy to hard. I think I only skipped one. A variety of HO's. Lots to do. The game length is medium to long, depending if you play Mahjong instead of the HO's( I found the Mahjong too easy), and if you listen to the story instead of skipping it. Leaves room for a sequel and I hope one is made. Rated 5 out of 5 by Streva from Excellent game!! Lots of different kinds of mini-games! 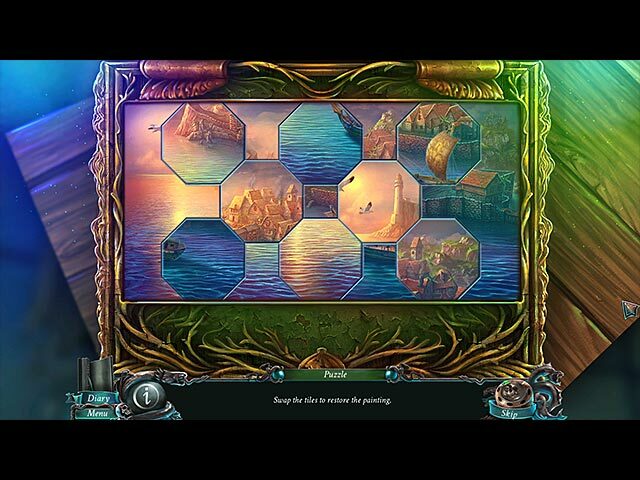 This is another high quality game from the developer Artifex Mundi. The story is interesting and well written, I cared about the characters and their dilemma, the game play made sense, the mini-games are easy, fun, and varied, and the drawings, voices, animation, and videos were great. Plus, there were not too many HO's and the game actually let's you keep a useful item throughout the game--what a concept, I wish more games would do that. Also liked that scenes closed when completed and the developers actually wrapped up the story at the end--thank you for that! Overall, an excellent, fun game of the highest quality. Loved playing it. Rated 5 out of 5 by Lesley_Alice from So well done and so much fun I loved every single detail of this game, from the sound and visual quality, the attention to detail, the story line, the games puzzles and HO, the characters, and the overall play of the game. So worth it!! Rated 5 out of 5 by midnightangel4u from What a Great Game!!! This is one of the BEST Games I've played in awhile. The Awakening Series are my favorites but now this ranks right up there. The graphics were awesome and the story line was great fun and you won't want to skip even one part of it. The Interactive Map was perfect and I loved the HO'S as they were all another game with-in themselves (a cleaver idea to be sure-:). I always like the fact that you can either 'lock or unlock' your Inventory Bar and this game has that feature. I don't think you will be disappointed in this choice game. Rated 5 out of 5 by AdrianaIP from Wow!!!!!! The story grabs you from the start and does not let you go. The visuals are very attractive, the HOS are OK (with two variations that are more fun - a fragmented one and one with silhouettes that is a mini adventure of its own) You can bypass the HOS to play mahjogn instead. It is as if you were watching a movie, where you have to move things forward every now and then. And the movie is worth the ticket price. Definitely one of those games that take your breath away.